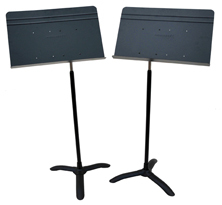 Our Music Stand Rental inventory includes over 100 Manhasset Music Stands. We also offer the Manhasset Conductor Stands. We have a enough music stands to cover a string quartet to a large symphony orchestra. Need Lights? We also carry Manhasset Music Stand Lights which enhance all your outdoor or darkly lit indoor performances. For Music Stands Lights add $2.50 to Music Stand Rental Price. Let us enhance your performance today.